An awful lot of people have said an awful lot about composting. Mostly, they make it sound like an awful lot of work. Let me clear the air: composting is easy. And homemade compost is great for your garden. Here’s your “composting for beginners” guide! You (yes, you) are nothing but a conduit. A middle person, if you will. The compost? It doesn’t need you. 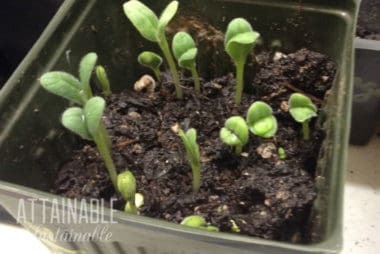 You do not have to do anything to turn your kitchen scraps and garden waste into homemade soil amendment. Mother Nature will do it for you. Most gardeners, though, want to generate compost for use in the garden. To benefit from the natural composting process, you’ll need to collect material and gather it in one spot. First, let’s talk for a minute about why we should all be composting. Kitchen food waste that is tossed in the garbage ends up in our landfills, taking up space and emitting methane as it decomposes. Food waste that’s tossed in the trash wrapped in plastic has a hard time decomposing at all. Composting creates terrific soil amendment for use in the garden. Silly to throw away food waste and then go buy compost that’s been trucked in complete with a plastic bag, right? Even if you don’t have a garden, there are plenty of people who would be happy to take finished compost off your hands. They might even take your raw kitchen waste. Passive composting is an easy way to turn your waste into a useful product without much work on your part at all. You do not have to have a fancy composter. All you need is a place to put your compost pile. And that’s all it has to be: a pile. 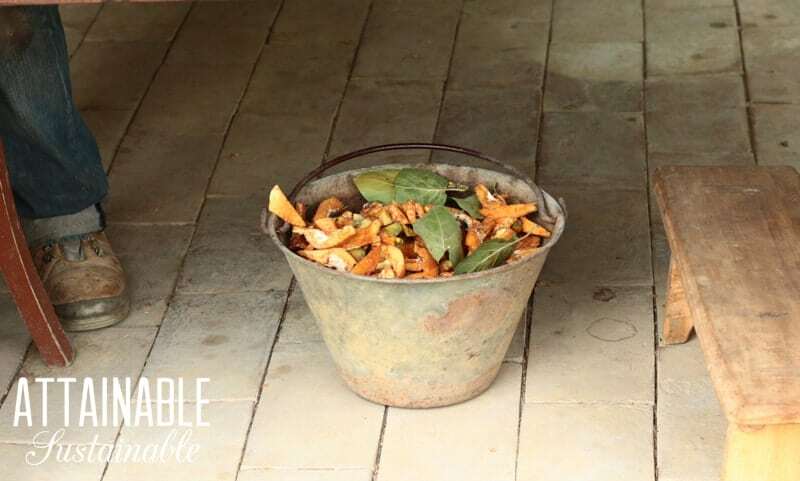 Dump your kitchen scraps, lawn clippings, and leaves in a pile and forget about it. Ooh, I can see the die-hard hot compost people cringing now! But think about it. When left to its own devices, forest waste (leaves, needles, branches) eventually breaks down and turns into a lovely compost. That compost (or humus) feeds the forest. The same thing will happen in your pile, albeit on a much slower time frame than if you really worked at it. You can help the pile to be more efficient by being mindful of what you add. The best pile has two kinds of waste: damp, wet, gloppy kind of stuff (think potato peels, lawn clippings, coffee grounds, and tomatoes) and dry, crunchy stuff (brown leaves, paper, or straw). In technical terms, those are considered nitrogen and carbon. (My definitions are so much more colorful, don’t you think?) Aim for more carbon materials than nitrogen materials; a roughly two-to-one ratio is a good bet. Passive composting doesn’t require much from you. How’s that for music to your ears? 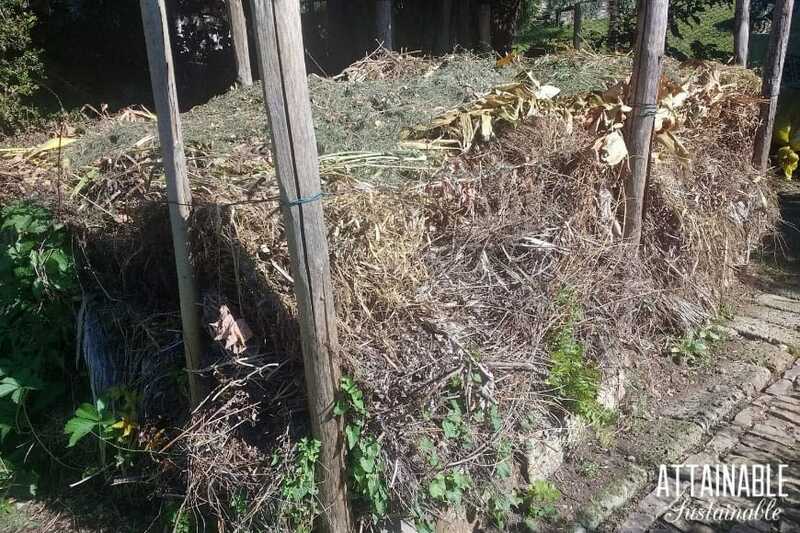 Now, a no-frills passive compost pile is easy, but it’s not necessarily attractive. If you’d like your pile to look a little neater, you can contain your passive compost pile in a variety of ways. Form wire into a three-to-four-foot diameter round to make a simple wire compost bin. Use logs to create an edge. Line up bricks or concrete blocks to contain the waste as it breaks down. Use a ready-made plastic bin. Build a two or three section wooden system. Pallets are an inexpensive way to form the sides for a system like this. No matter how you choose to contain your waste pile, passive composting for beginners is a good introduction to the process without being overwhelming. Just keep adding compostable materials until the area is at capacity and then let it sit undisturbed until it’s completely broken down. 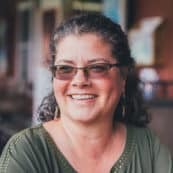 Another composting for beginners tip? 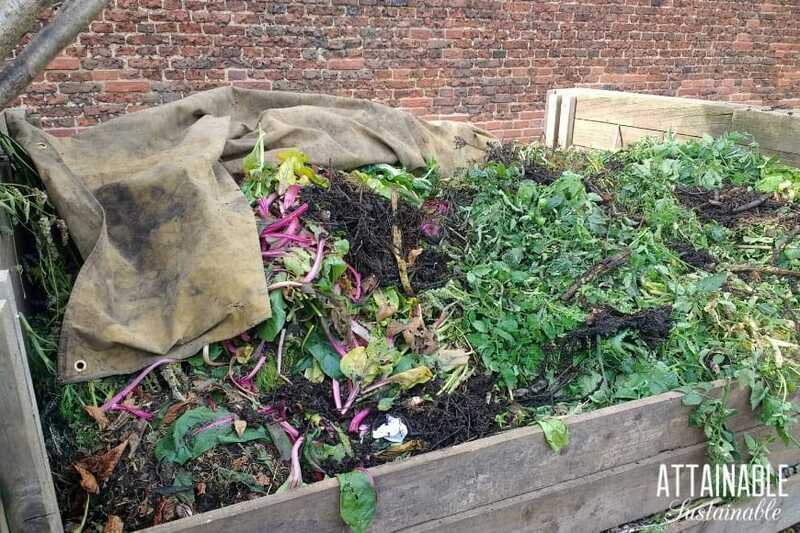 Heap compost items on an unused garden bed throughout the winter months and you won’t even have to move it. Come springtime, plant your garden right in the well-amended space. There are some things that just shouldn’t be tossed into your waste pile. Here’s your composting for beginners primer in what not to compost. Meat and dairy products. These can begin to smell and will attract animals. That’s not to say they won’t break down — they will. If you’re not concerned about odor or attracting animals, you can certainly add small amounts of these to your pile. Another way to dispose of meat and dairy that will benefit your garden? Bury it. Pet waste. While the manure from farm animals is a great boost to compost piles and soil productivity, the waste from dogs and cats should be disposed of in the trash or in a special pet waste disposal system. Coal ash. Wood ash from your fireplace or wood stove is fine. Coal ash or barbecue waste is not. They’re high in sulfur and iron and can damage plants. Diseased plants. While a hot compost pile might kill pathogens, it’s just not worth it. You’d hate to spread disease to your garden when you are trying to improve it with compost. Synthetic and inorganic items. Plastic and tin foil won’t break down in a compost pile. Dryer lint from loads of polyester and synthetic fabrics should be avoided. And synthetic chemicals or plants that may have been sprayed with pesticides are a definite no-no. Some of those pesticides are persistent and will not break down in a compost pile. While I’ve got a number of compost piles, a worm bin, and chickens to work through much of my waste, I have a problem with invasive weeds. 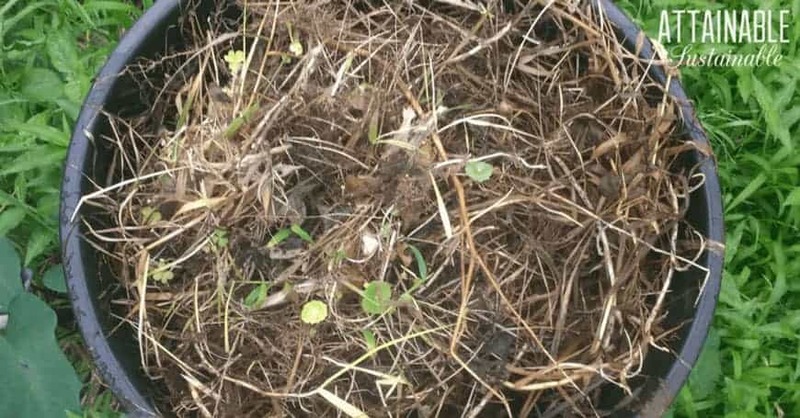 Living in the tropics means lots of vines, and tossing those vines in a compost pile? Is just like planting them. They root easily and quickly. We decided to experiment with a compost drum to dispose of invasive weeds without having to haul them off-site. Over the course of a month or so, I stuffed a compost tumbler with the invasive yard waste that I won’t add to my regular compost bin. Because the materials are contained and up off the ground, they can’t send out roots. The materials kind of collapsed after a few days in the tumbler and as there was room, I added more. Five months later I “harvested” the homemade compost. There were still a few pieces that were a bit big, but I just tossed them back into the tumbler for another round. So, did it work? It did. The weeds I put in the tumbler broke down into a nice, earthy compost that I can use in my yard without fear of introducing invasive weeds. The size of the tumbler and the length of time it took to break down is a big drawback, though. In my year-round growing climate, I generate way more waste than I can feasibly process through this tumbler. In a smaller yard, though? And one that has fewer invasives to deal with? It could solve the problem of disposing of green items that might threaten to root in a compost pile. Beginners often ask about the creepy crawlies that appear in their piles. They’re to be expected! Food waste in a compost pile may attract a variety of pests. If you’ve got raccoons or neighborhood dogs that might be tempted to dig in, you’ll want to protect the pile somehow. Fruit flies, too, can be a problem. To reduce their population, try to keep dry, crunchy stuff on the top of the pile. Use a garden trowel to lift the top layer and tuck any kitchen waste underneath. If you are really concerned about keeping animals — say bears — out of your compost, the easiest solution is to use only yard waste in your compost pile. Kitchen scraps can be composted in a worm bin. What if you don’t have a lot of space? Your leftover salad greens, apple cores, egg shells, and gnarly vegetarian leftovers can go straight to the root of your garden when you use this method, which is ideal for urban gardeners. Toss compostable items into your blender so that it’s about a third full. Note: Only you know what your blender can handle. If you’re not sure if yours will tackle a whole, wilted sweet potato, you should probably skip it. If you cannot have a pile above ground (see: bears), trench composting is another option. It’s just what it sounds like: Dig a trench or hole in the garden, right where you’d like to improve the soil, add kitchen waste, and bury it. 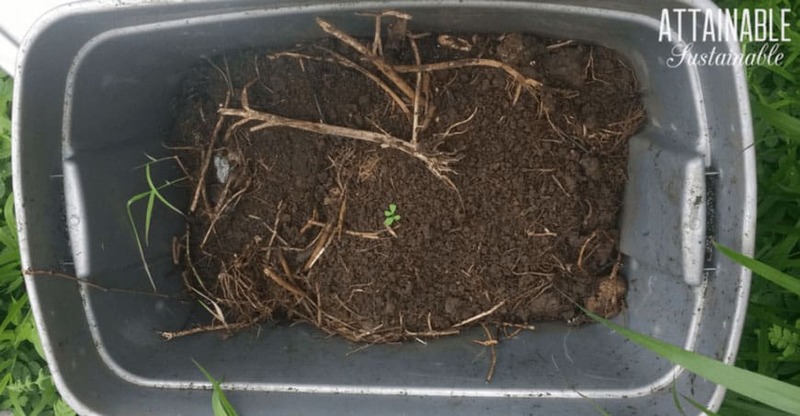 Active composting is often called hot composting because the internal temperature of the materials when it’s being actively worked can reach temperatures of 120-150 degrees Fahrenheit. This heat kills weed seeds and any disease that might be present and assures a fast breakdown of materials. Hot composting requires more effort, but results in a usable product in about four to six weeks. Combine carbon and nitrogen materials in a pile at a 2:1 ratio. For every two pitchforks of carbon materials, add one of nitrogen. For the fastest results, start with materials that are chopped into small pieces. Leaves and grass will break down more quickly than whole apples and branches. Sprinkle the pile with water as you build it, aiming for a pile that is moist but not wet, much like a wrung-out kitchen sponge. In order for a hot compost pile to remain hot, you’ll need to make sure that the pile is a minimum of one cubic yard in size. Once a week, use a pitchfork to turn the pile. The easiest way to do this is to shift the pile over. Pitchfork the material from the top of the pile so that it’s adjacent to the first pile, and continue dismantling the old pile and building a new one right next to it. Sprinkle with water to maintain moisture if necessary. If you keep chickens, be sure to let them help! 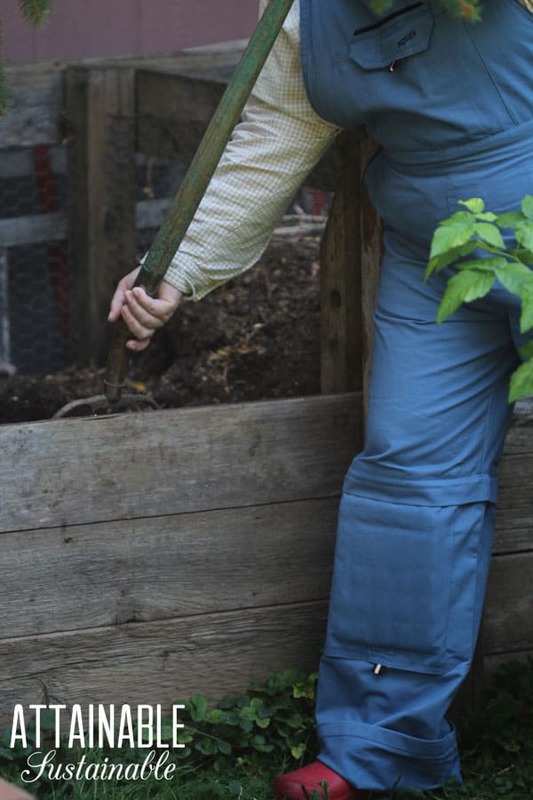 Here’s how to put your hens to work in the garden. Vermicomposting utilized worms to break down food waste. It’s easy to make a worm bin and it’s a great way for apartment dwellers to deal with kitchen waste. You compost right in place when you create a lasagna-style garden bed. You are so smart! I love it! Shelly, you are invited to come by any time and tell me how smart I am. However, after I figured this out, I couldn’t help wondering why it took me so long! This post made me laugh until the photo of the chicken and I realized you were serious. Gives me another reason to want chickens in my garden! Genius! You’ve really got this system down! Those chickens sure come in handy! Ok, now I’m wanting chickens. My niece just got some, so maybe I’ll visit hers for a chicken fix. Good thinking. I will share this with my friend who has both chickens and compost! What a cool system. I’m enjoying reading about your efforts. Love this post. That’s the exact topic that has been on my mind lately. My compost creation so far has landed me nothing, as I put it at the foot of my pear tree and it keeps growing roots and feeding right out of it, maybe I am not turning it enough?! But I sure was shocked when I went in to turn it and my shovel was stopped by a mass of happy, white, pear tree roots. I built my compost bins last week by lashing together wooden pallets. I put them right nest to my (new) chicken coops and where I am building my garden boxes next spring. This is my first go at composting. This is a great idea. My parents composted when I was a kid and it was my job to haul the scraps to the pile every night:) When we were in Maine in the summers, composting consisted of dumping the scraps off the side of the dock below the high tide mark, which I’m sure now might not be the best practice. 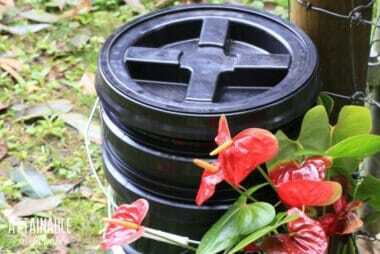 P.S.- The garden worms take care of the aerating and composting. They LOVE rabbit manure! We have been doing this for over a year. Our local coffee house saves us their coffee grounds. We add scraps. and when we clean out the chicken house we add the droppings. A new spot each time we clean out the chicken house. I was amazed at the 1st spot. Beautiful rich dirt and we live in the “red clay fields” of North Carolina. Smart thinking. In Africa they build keyhole gardens with the same principal in mind. 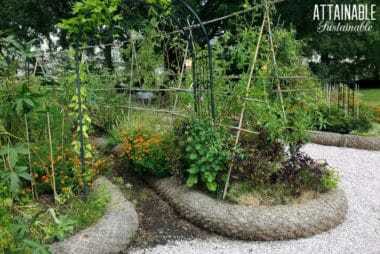 They build a wicker tower, and around it they build a large circular raised garden bed with an opening so they can walk up to the wicker basket. Then they compost and water right in the basket and it feeds everything growing in the bed around it. Genius and easy. I’ve practiced ‘compost lasagna’ for a while, but without chickens. I do this in the fall, after the raised bed is done for the season. If I’m removing plant debris (I don’t remove from the herb garden, that debris overwinters in case any lady bugs, caterpillars, or praying mantis cases are overwintering with it) I’ll boost the soil by layering fresh kitchen scraps, guinea pig bedding, and shredded fall leaves under a layer of coffee grounds (we’re tea drinkers, so we get big bags of grounds from the local shop) and letting that rot in place. In the spring it’s mostly composted enough to plant directly into the raised bed, then I supplement with compost from the worm bin and outdoor com posters throughout the summer. In the fall, repeat. Now, if we could have chickens within city limits . . . .
Wow! You inspired me. For a long time, now we’ve been talking about making a raised bed sized chicken hutch – I think I’m going to move forward on this after reading your post. I’m all for less work! Can you take some pictures of the compost bin and the various stages please? I tried composting once with a square plastic composted I go at Menards. It didn’t work very well. Great post! I love making compost, its great for my garden and reduces the waste we send to landfill. I also use compost worms because I’m in a dry climate and I find that compost dries out too much here. recommend spraying the bin with water once in a way, to hasten the process of composting.I found sprinkling of slurry made of cow dung and water has done wonders to my compost pit.C.R.Rao.